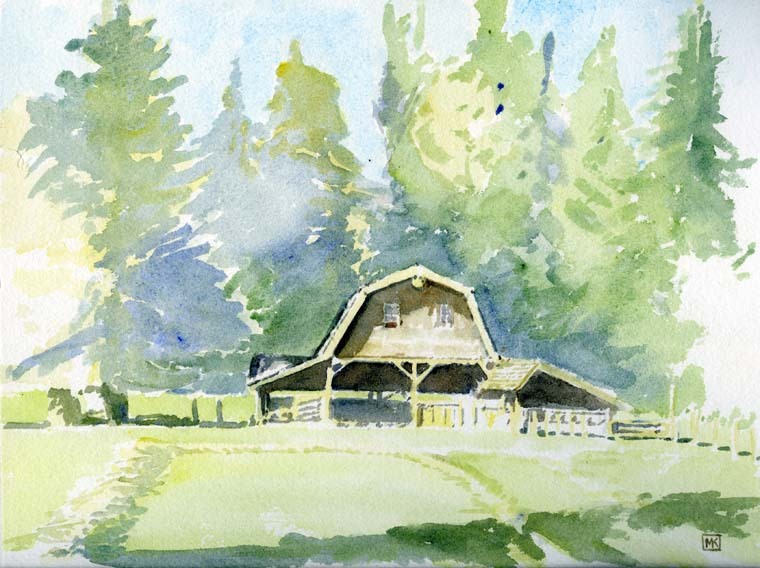 This is hardly a travel page, in that we lived in the Fraser Valley for a dozen years, but I went back in the late summer of 2006, as if on a trip, after we'd sold the farm and moved to the city, to paint a few of the spots left there that I wanted to remember. Some I'd painted before, but the paintings had been sold. 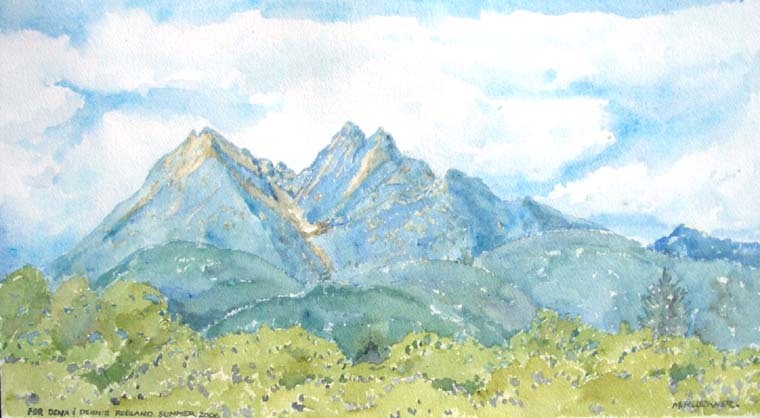 I was surprised how few places there were that I wanted to put into the sketchbook – I think I ended up so dismayed by the ugliness of the "new" valley, versus the pastoral quality of the one we moved to (or at least we imagined we'd moved to). In my typical sketchbook way, I was drawn to the implied narrative of the places that had outlived their time. They're on the edge of change, which in the valley context usually means erasure. 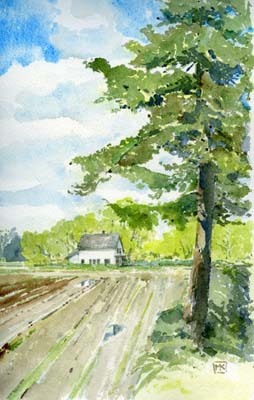 There were some country road pictures I painted in the mid 1990s that were all sold through a gallery in Fort Langley. They belong here too. I went in 2010 and 2012 and painted/drew some images of the magical home of our friends, Jan and Dyna Tuytel; they're at the bottom of this page. When we travelled west from our farm in South Langley, we passed through the Hazelmere Valley on our way out to the White Rock area and Hwy 99. On 8th Avenue near the eastern end of the valley, at about 188th Street, there is a rough-edged working farm whose fields straddle 8th. It's one of the last ones left in what has become a country-estate area, with mansions occupying the high ridge between 8th and the US border. 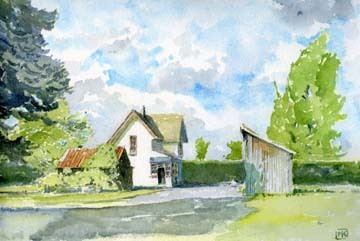 (Above) the centrepiece of the farmyard is an old Gothic Revival farmhouse, perhaps from 1900 or even earlier, surrounded by sheds, trailers and implements. The farmers themselves are classics in their own right: you can imagine them on days off riding Harleys with a biker gang -- they've got that look. Huge bearded men wearing torn overalls and piloting their quad-axle Fiat tractor to and from their various fields, forcing the Audis and the BMWs to slow down and hug the narrow shoulder. (Right) across the road, on the south side of 8th, an abandoned farmhouse sits on the edge of one of their cornfields, framed by a line of weeping willows. They plow right up to the edge of the blackberry patch that has almost engulfed the farmhouse. When we moved to the valley in 1992, there was a huge barn in the field past the willows, but it blew down into a spectacular heap in a windstorm soon after. Years later, by which time the ruin had subsided into its own blackberry patch, the owners set it alight and then plowed over and planted the land. Ken Bose's family farms a beautiful piece of fertile bottomland -- supposedly an ancient channel of the Fraser River -- west of Cloverdale in Surrey, as they have for more than a century. The land is bisected by 64th Avenue, the frantically busy arterial once known as Bose Road. For 10 years I bought wheat and barley from him for our chickens and sheep, and in the autumn loaded my pickup truck with straw from his fields (42 bales was the record on the old Datsun) for wintertime bedding. Ken was (and is) a classic organic farmer, trying to balance iffy weather and demand for new crops while keeping his farm solvent as the suburban ugliness creeps ever closer. The view above is from the grassy bank above the old landmark barns, looking west toward the mountains that are on Vancouver's doorstep. 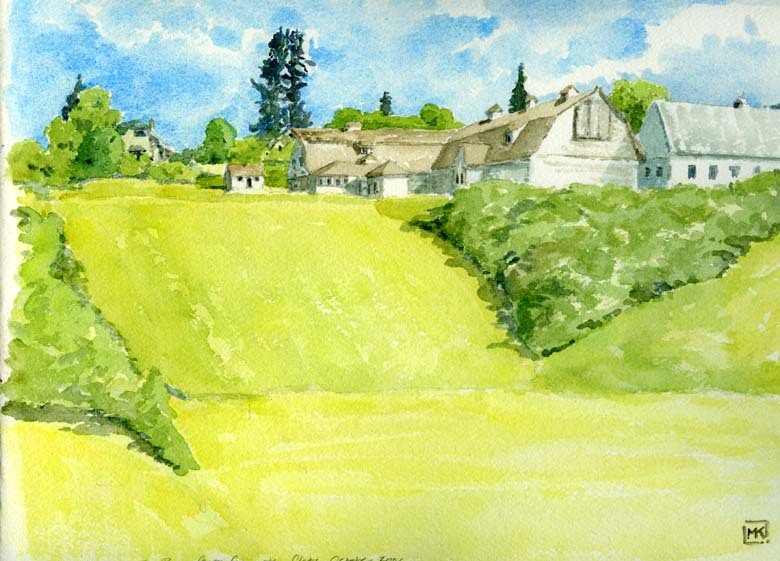 The one below is from the edge of 64th Avenue looking up the hill past the family barns toward Ken's house and sheds (in the small watercolours further below). We drove by in July, 2007, and found that the snow load from the previous winter had broken the back of the old barn. Ken Bose's farmhouse, on the highest point of land above the old family barns, used to stand in superb isolation overlooking the fields. In the last 5 or so years, new condos and dream homes have pushed westward almost to the edge of his yard. The driveway continues past the farmhouse (in the picture on the left) and mounts a slight rise toward his sheds. Past the red building was a series of low granaries where Ken kept his crop, and where I would go a few times a year to buy a truckload of sacked feed. 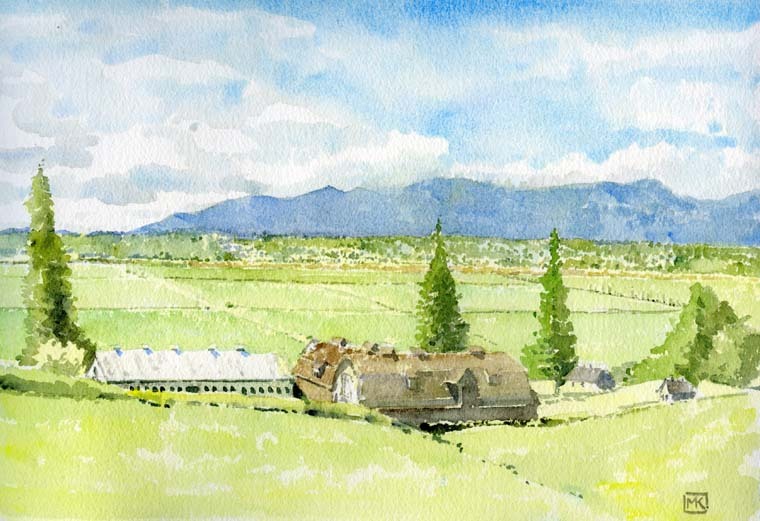 To my mind, the most beautiful spot in the Fraser Valley is Milner, the grassy valley northeast of Langley City that was the site, beginning in 1827, of the Hudson's Bay Company farm -- the first colonial agriculture west of the Red River Valley. It was a place to pass through, along Glover Road on the way to Fort Langley for visiting or whatever. Old barns, hayfields, lines of trees and fine views of Mount Baker, all part of the Agricultural Land Reserve so it just may be saved. 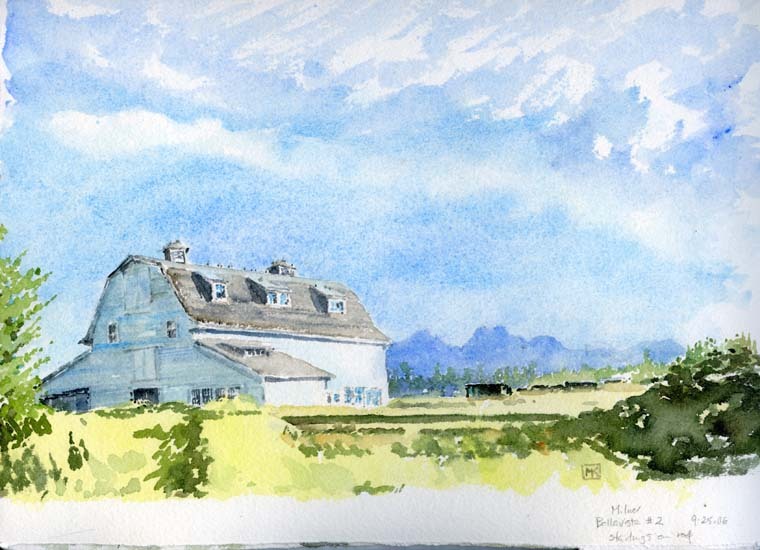 The watercolour above looks north toward the mountains past the old Bellavista #2 barn on Smith Crescent. The Bellavista farm with its Jersey cows was liquor distiller Harry Reifel's real love. The other barns and his home, much altered, still stand along Glover Road. 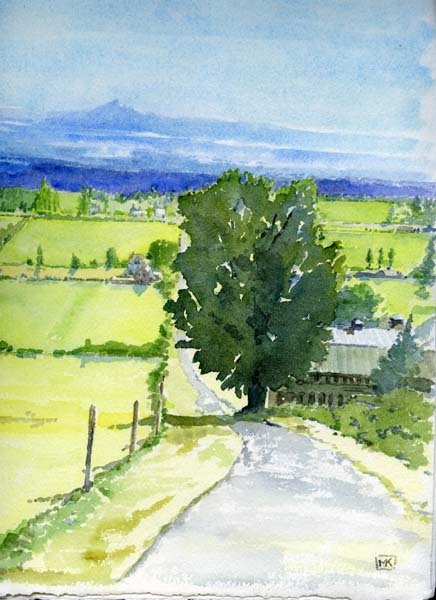 The sketch to the left is the view from high up on Crush Crescent looking southeastward to the blue hulk of Mount Baker, almost lost in the summertime morning mist. The Tuytels' home was buried in the Langley forest east of Milner. Jan Tuytel was a major character in The Pullet Surprise and Wise Acres, the two books I wrote about our time living in the valley. Jan and Dyna were Dutch; they immigrated to Canada in the 1950s, raised a family and, in many ways, were typical of the migrants arriving in the "new world" after the war. But Jan was different: a farmer who became a stonemason, a self-taught carpenter, my mentor for sheep and an inspiration for both Christine and me for growing all sorts of things. 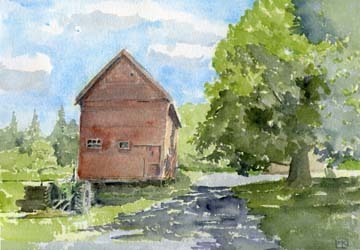 He hand-built all the structures on their property – a picturesque cottage straddling a creek, a workshop and the barn illustrated below, put into my sketchbook about 2000. I've never seen anything like these buildings, and never met a couple so inspiring. I painted their place from all angles and foolishly sold them all – this was the only image I had left. We visited them in the summer of 2007. They were both getting old. Jan insisted he'd be carried out feet-first. Update 2010/12: Jan died at the beginning of May, shortly after we'd returned to Canada from Australia. We saw him about a week before he died on a cool, sunny day. 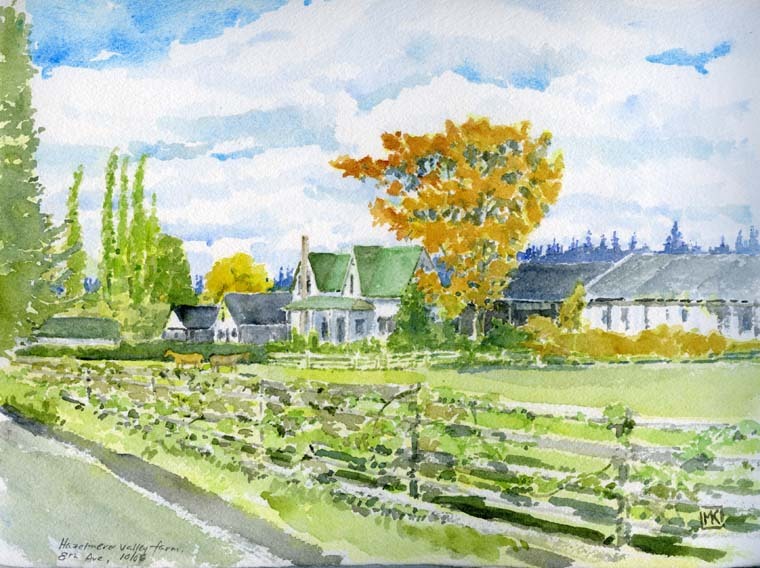 After visiting for a while, I left him to rest and hiked up to the top of his field to paint the watercolour below, then followed it with the brush/ink drawing of the driveway. I was able to write a proper memoir/biography of him and Dyna and include it in Vanishing Vancouver: The Last 25 Years, pages 178-81, and include images with it; his place served my (otherwise very urban) book as the classic small farm, the successor to the subsistence farms on the edge of the growing city.